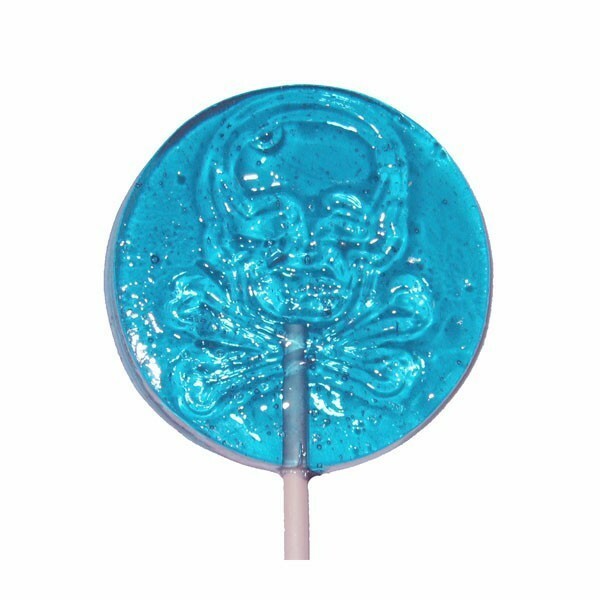 Celebrate that pirate life ahoy in style with these wonderful skull and crossbones crystal barley candy lollipops. Minimum 10 required but buy as many as you need! Lollipops are all custom hand made crystal barley candy pops. This listing is for individually wrapped lollipops in 1 flavor/color. If you would like additional lollipops or flavors, please email or call with custom requests. All lollipops are freshly made, individually wrapped and sealed for freshness and shipped right out to you. All lollipops are made fresh on weekends and shipped out on Mondays and Tuesdays via priority so they are not in transit over weekends. AVAILABLE IN MANY VARIOUS COLORS & FLAVORS AND FREE FROM NASTY ARTIFICIAL PRESERVATIVES! Always in stock flavors are: Orange (natural oil) - orange Strawberry - pink Lemon (natural oil) - yellow Lime (natural oil) - green Cherry - red Cheesecake - yellow Bubblegum - pink Apple - green or red Maple - brown Raspberry - blue or red Watermelon - pink/red Root Beer - brown Peppermint - green (natural oil) Limited edition flavors include blueberry, strawberry banana, strawberry kiwi, cotton candy, orange cream, tutti frutti, honey and tangerine, please check for availability. We can also make unflavored and uncolored barley pops for people with sensitivities, please convo me with custom requests. I CAN CUSTOM MAKE ALMOST ANY THEME OR SHAPED LOLLIPOP FOR ANY OCCASION IN CRYSTAL HARD CANDY AND CHOCOLATE, INCLUDING DINOSAURS, WEDDING THEMES, CHARACTERS, ANIMALS, NUMBERS, LETTERS, TRAINS, PLANES AND CARS AND SO MUCH MORE. IF YOU'RE LOOKING FOR SOMETHING SPECIAL AND CANNOT FIND IT IN MY ETSY STORE, PLEASE EMAIL ME AND I WILL GET RIGHT BACK TO YOU.